THE WHOLE SERIES OF SUPERSTITIONS IS BUT THE SEARCH FOR TRUTH AMIDST IGNORANCE. PECTACLES, telescopes, microscopes, spectral analysis are but so many corrections of the ascertained inadequacy of our visual apparatus. There can be no exact comprehension of reality, except through a reasoned knowledge of previous errors; this is the price that must be paid for a science of intellectual optics. OUR INSTITUTIONS ALSO ARE NOT THE PRODUCT OF SPONTANEOUS GENERATION. THEY ARE DERIVED FROM THE HUMAN SOUL, WHICH NEVER CEASES TO FASHION AND MODIFY THEM AFTER ITS OWN IMAGE. EACH ONE OF US TOILS AT THIS WORK DURING HIS DAY & GENERATION UNTlL HIS BREATH CEASES. THE DUST THAT WE HAVE QUICKENED RETAINS OUR MEMORY AS LONG AS THE STREAM RETAINS THE REFLECTION OF ITS BANKS. The passions that have thrilled us, our hopes and fears, our struggles, our victories, our defeats, all have left their faint and shadowy traces. The accamulation of sach traces, indefinitely repeated by multitudes of our fellow-men from age to age, constitutes laws and codes, religions and dogmas, arts and sciences, and, finally, the different types of society. We are not less active than the infusoria, whose remains harden into concreted rocks and are piled up in mountainous masses. LIE Reclus whom I knew for a good many of years was one of the best men Ihaveever met.he was not only a great scholar, a deep thinker, a devoted fighter for the Commune of Paris and for justicein general, but also a generous, self-sacrificing man. I may mention the following fact, with which I am closely connected: When the member of the Comité central de la garde nationale during the war of 1870-71 and the Commune, Captain Andignaux, fell very ill on his return from exile, he confided his two children to my wife. According to French law, she could not be the guardian of the children of strangers. 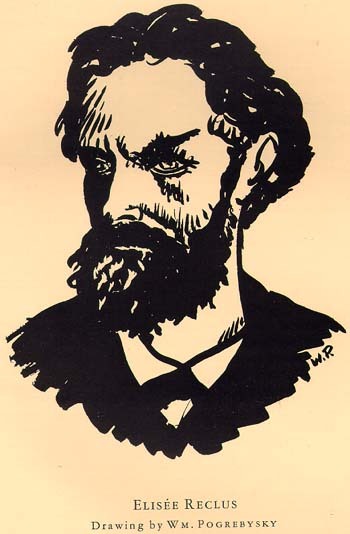 She was obliged to appoint a family council; and as she knew no more honest and devoted man than Elie Reclus, she thought of him immediately and of Arthur Arnould, a member of the Commune, novelist and historian. Both consented at once; Elie was appointed guardian, and Arnould assistant guardian. Elie took to heart the duty he had assumed, and till his death he was like a father to Edouard Andignaux, whilst we took charge of the girl who died in March, 1924. Both children were placed in the famous school of Compuis directed by one of the greatest educators who ever lived, Paul Robin. Elie Redus, though far from being rich, provided all the garments, linen, etc., necessary to enter the school. And all the time Edouard was under the supervision of M. Robin, Elie Reclus never ceased to lavish his attention on him. When Edouard had finished the course of studies at Compuis, Elie placed him at the high school of agriculture of St. Bon (Marne), paying all the fees. After the course was completed, Edouard, who wanted to study vine growing, was placed by Elie Reclus in the great estate of his brother in-law M. Faure, near Bordeaux; and later in Algeria. All this time Elie Reclus had to pay for the young man, whose father he had hardly known, but who had fought for the same cause as he. Elie never ceased to be interested also in Mathilde, our adopted daughter, and I have a great many letters of Mrs. Reclus addressed to Mathilde, who was also very devoted to her guardian. Mrs. Reclus was a model of kindness and thorough common sense. Like Elie, she would never submit to fashion, and she remained the same pattern of simplicity as she had always been. Her home was hospitably open to the old companions of her husband, the anarchists, etc. I have personally dined with well known men from the province or from abroad, like Dr. Oelsnitz, a Russian exile, contributor to the anarchist press. After Vaillant had thrown an inoffensive bomb in the Chambre des Deputes, Paul [Reclus] was accused of giving money to Vaillant for this act; but it was only a police fabrication. A search was made in Elie's dwelling by the police without any result. But my wife's name and mine were found among others. This was enough to place me on the list of suspected persons, and my wife was nearly expelled from Switzerland and I in London was shadowed by the agents of Scotland Yard, although I had never heard of that Vaillant. In Switzedand, where Elie had been professor at Zürich, and at Brussels where he also taught, he left a most sympathetic memory. HAD corresponded with Redus a long time before I made his personal acquaintance. It was at a lecture Reclus gave in London about Anarchism. He spoke more than an hour on that subject, without insisting on the absolute necessity of communism in anarchism. I then spoke not to contradict him, but to expose my ideas on the danger of anarchism without communism. I said, I had seen a country where there was no law, no police, but where every house was a fortress and nobody dared to go out without being armed to the teeth. Reclus immediately understood and recognized the country; he told me I had spoken of Free Swanetia, in the Caucasus, a country which since that time was conquered by the Russians, who never succeeded in pacifying the inhabitants. At the end of the war the Swanetes regained their liberty, but the Bolshevist invasions brought again tyranny, and since that time there have been constant rebellions against invaders. The last time I saw Reclus at Clarens shortly before his departure, I nearly lost my life. We were returning, my wife and I, by boat to Marges, (about 47 kilometres from Clarens) whence we had to walk an hour to reach the village, where a cousin of mine was expecting us. A fearful tornado arose; the storm was terrific on the Jura mountains above us, many thousands of trees were uprooted and on the other side of the frontier, in France, whole forests were devastated and a great many houses were blown down. Happily the tempest did not last long and we could land and walk to the village drenched through. I shall never forget the scene we witnessed that evening.